I planted an amaryllis yesterday looking forward to some Spring in my January. I plopped the chunky bulb into a clay pot of wet peat and slid it across the counter near my window. The bulb looks inert, but with light and time those little green cells hiding under that dry brown skin will do marvelous things. 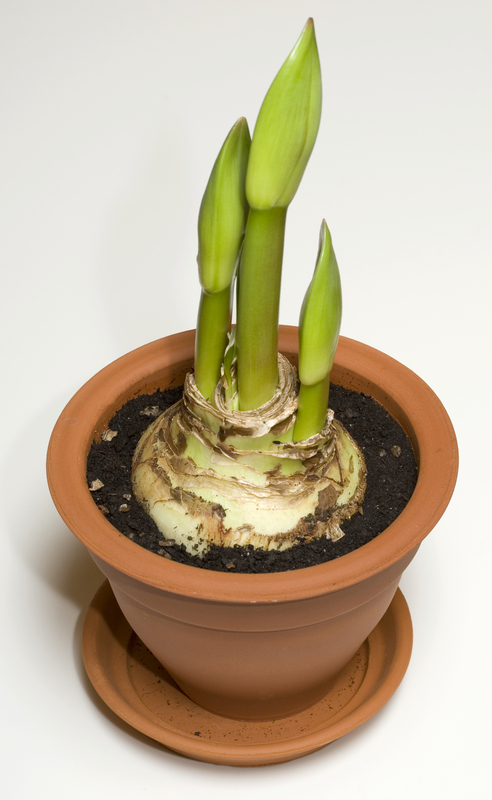 That familiar spiky amaryllis surge will not happen immediately though, and I’d be a fool to expect it. So why, I wonder, looking outside to a cold day, do I expect myself to surge after January 1? When I turn on the TV, or stand in a grocery line reading magazine covers, calls to make dramatic life changes are everywhere. Weight loss, fitness, and de-cluttering projects beckon in every other headline. Self-improvement initiatives compete with notices of post-holiday sales in my email and suburban mailbox. Media screams: GET GOING. While driving to my annual physical, deliberately scheduled as a chance to take stock as the New Year begins, I realized that what is wrong for me about the press for activity in January is that I’m not ready for it. Resolutions feel premature and forced, a form of madness more appropriate to another season. It is Winter–a time when many living beings hibernate. So instead of a round with a personal trainer, I am considering living off my fat for awhile, like squirrels and bears in northern climates. I wouldn’t have to eat much in hibernation, since the store around my mid-section would most certainly support writing, napping and sitting in front of the fireplace on a bleak afternoon. What little I require I can get from my pantry and freezer—both well-stocked, or in serious need of cleaning out–depending on your point of view. Moving my hibernation thoughts along to less ordinary concerns I find myself taking a hard look at my current responsibilities in the Middle East. Quickly I realize that not much is up to me right now on the national and global front. The world and its messes are not likely to miss me for a month or so. I don’t know how to measure psychic energy, but I know I am saving some with my new thinking about hibernation. Life, and the chilly season, both seem easier. I notice I am sitting straighter in my writing chair and greeting my coaching clients on the phone with a sense of curiosity and optimism. And I am getting curious about what lively directions I might choose for the year ahead. But I know it’s too early to name these, let alone to act on them. “Go inward,” is what keeps echoing in my head. Retract or exert, what’s really the best thing? Should I put the press on myself and take action on new projects, instincts be damned? I like to work hard and feel like I am making a difference. I know life passes all too quickly without my permission and I want to keep growing. Still, as I stretch out my legs in front of the family room fireplace, I remind myself that a happy life is not always surging forward and the ground in my January probably only appears fallow.